For the 1964 album by Millie Small, see My Boy Lollipop (album). "My Boy Lollipop" (originally "My Girl Lollypop") is a song written in the mid-1950s by Robert Spencer of the doo-wop group The Cadillacs, and usually credited to Spencer, Morris Levy, and Johnny Roberts. It was first recorded in New York in 1956 by Barbie Gaye. A later version, recorded in 1964 by Jamaican teenager Millie Small, with very similar rhythm, became one of the top selling ska songs of all time. The original song, "My Girl Lollypop", was written by Robert Spencer of the doo-wop group The Cadillacs. Notorious record company executive Morris Levy agreed to purchase the song from Spencer. Although not involved in writing the song, Levy and alleged gangster Johnny Roberts listed themselves as the song's authors. In an effort to avoid sharing any royalties with Spencer, Levy removed Spencer's name from the original writing credits. Levy even claimed that Robert Spencer was his pseudonym. The song caught the attention of one of Levy's partners, alleged mobster and music mogul Gaetano Vastola, aka "Corky". Vastola had recently discovered 14-year-old singer Barbie Gaye after hearing her sing on a street corner in Coney Island, Brooklyn. Vastola was so impressed that he immediately took her to meet New York radio DJ Alan Freed. Gaye sang a few songs for them and Freed was equally impressed. Vastola became Barbie Gaye's manager and within days, he acquired the sheet music and lyrics for "My Girl Lollypop" from Levy. He gave them to Gaye, with no specific instructions except to change the gender of the songs subject and be ready to perform it by the following week. Barbie Gaye changed the song's title to "My Boy Lollypop" and rewrote the song accordingly. She added non-lyrical sounds, (utterances), such as "whoa" and "uh oh," chose the notes for the lyrics, shortened and lengthened notes, decided which lyrics to repeat ("I love ya, I love ya, I love ya so") and added the word, "dandy" to describe the subject. When it came time to record, Gaye cut school and took the subway to a recording studio in Midtown Manhattan. Gaye met the three members of the session band, guitarist Leroy Kirkland, saxophonist Al Sears and drummer Panama Francis. The band leader, Kirkland, asked Gaye to sing the song for them. After listening to her, they improvised music to match her vocals. They decided to record the song in a relatively new style of R&B called shuffle. The four musicians, including the white teenage girl, went into the studio and recorded the song in one take. Barbie Gaye was paid $200 for her writing contributions to "My Boy Lollypop" and her studio recording. The shuffle sound was developed in the early 1940s in America's black community and made popular by Professor Longhair, Rosco Gordon and Louis Jordan. Legendary Jamaican artists, Clement "Coxsone" Dodd and Arthur "Duke" Reid, introduced the R&B shuffle beat to Jamaica in the late 1950s. Over the next few years, the sound grew in popularity and evolved into "ska," Jamaica’s first indigenous popular music style. Ska has developed subgenres such as 2 Tone and Third Wave and has influenced several new Jamaican music genres most notably, rocksteady and reggae. Gaye's recording was released as a single by Darl Records in late 1956. It was heavily played by Alan Freed, and listener requests made the song No. 25 on Freed's Top 25 on WINS, New York in November 1956. The record sold in sufficient quantities locally to gain her a place in Freed's annual Christmas show at the New York Paramount in December 1956, when she opened for Little Richard. The following year, Gaye toured with Little Richard and Fats Domino. The singer and songwriter Ellie Greenwich, (Be My Baby, Chapel of Love) then a teenager living on Long Island, was so taken by the record that she named herself Ellie Gaye when she embarked on her recording career. Gaye's recording of "My Boy Lollypop" was popular in New York City, and a few other Northeastern cities. Like many artists in her day, Gaye received no royalties from radio play. Because her manager, Corky Vastola, routinely counterfeited his artists music to keep all the profits, the record's sales data is difficult to determine. Eight years later the song was discovered by Island Records founder, Chris Blackwell, who, with his associate Chris Peers, was trying to find songs for his young artist Millie Small to record. 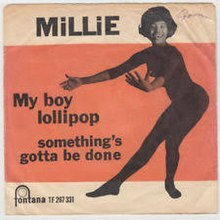 Changing the spelling to read "lollipop" instead of "lollypop", Millie's version was recorded in a similar shuffle/ska/bluebeat-style, and in 1964 it became her breakthrough blockbuster hit in the United Kingdom, reaching No. 2. The song also went to No. 1 in Republic of Ireland and No. 2 in the United States (on the Smash Record label, behind "I Get Around" by the Beach Boys). Considered the first commercially successful international ska song, Small's version of "My Boy Lollipop" sold over six million records worldwide and helped to launch Island Records into mainstream popular music. It remains one of the best-selling reggae/ska hits of all time. British reggae DJ David Rodigan has stated that watching Millie Small perform the song at the Ready Steady Go! TV show as a school boy initiated his lifelong passion for Jamaican music. The song featured in the 2012 Summer Olympics opening ceremony in London. It has also featured several times in the British TV series, Heartbeat. Schlager singer Heidi Bachert recorded a cover version, under the same title but with German lyrics, which entered the West German Top 20 on August 15, 1964, remaining there for 17 weeks, with No. 5 as top position The song was remade in 1974 by Maggie Mae reaching No. 17 on the German chart. A cover version by American singer Donna Hightower was recorded in French as "C'est Toi Mon Idole" in 1964 and spent time on both Canadian and French charts. The track "My Collie (Not a Dog)" on The Selecter's 1980 album Too Much Pressure is a cover version with rewritten lyrics. A cover version by Bad Manners, re-titled "My Girl Lollipop (My Boy Lollipop)", was a UK Top 10 hit in July 1982. UK singer Lulu released a version of the song on the Jive label in 1986 and reached No. 86 in the UK singles chart; not high enough to be considered a hit in the official top 75. Lotta & Anders Engbergs orkester covered the song on the 1989 album Genom vatten och eld as "På min sommaräng" with lyrics in Swedish by Christer Lundh.. In 2006 this version appeared on the retrospective collection Världens bästa Lotta. In 1997 Spice Girls covered "My Boy Lollipop" in their movie Spice World. Jamaican ska and reggae band The Skatalites recorded the song live in 2014. ^ "This is a listing of Alan Freed's Top Twenty Five records on his Saturday morning survey show on New York City station WINS from late November in 1956". Home.earthlin.net. Retrieved June 6, 2014. ^ "The Beatles at 78 RPM". Cool78s.com. Retrieved June 6, 2014. ^ Bruce Eder (October 6, 1946). "Millie Small | Biography & History". AllMusic. Retrieved July 17, 2016. ^ "Jimmy Powell". Brumbeat.net. Retrieved July 17, 2016. ^ "The Radio Academy - David Rodigan". Archived from the original on September 27, 2007. Retrieved 2008-09-24. ^ "Item Display - RPM - Library and Archives Canada". Collectionscanada.gc.ca. June 29, 1964. Retrieved December 3, 2018. ^ "The Irish Charts – Search Results – My Boy Lollipop". Irish Singles Chart. Retrieved December 3, 2018. ^ Lane, Dan (November 18, 2012). "The biggest selling singles of every year revealed! (1952–2011)". Official Charts Company. Retrieved August 28, 2014. ^ "The 100 best-selling singles of 1964 [in the U.K.]". www.sixtiescity.net. Retrieved February 21, 2018. ^ "INFINITY CHARTS: German Top 20". Ki.informatik.uni-wuerzburg.de. Archived from the original on December 10, 2007. Retrieved 2016-07-17. ^ "INFINITY CHARTS: German Top 20". Ki.informatik.uni-wuerzburg.de. January 22, 2001. Retrieved July 17, 2016. ^ "L'almanch du rock". Billboard. Retrieved December 11, 2015. ^ "Top 40 Official UK Singles Archive". Official Charts Company. Retrieved July 17, 2015. ^ "ChartArchive - The Chart Archive". Chartstats.com. Retrieved June 6, 2014. ^ "Genom vatten och eld" (in Swedish). Svensk mediedatabas. 1989. Retrieved June 5, 2011.